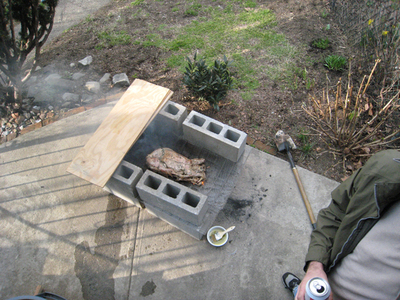 Brandon and his pal, James concocted a somewhat kooky scheme to roast a goat for Easter. In our front yard. Of course, my concern was for the garden - that they would alight something on fire or possibly alert the authorities. But they built a nice pit from cinder blocks and purchased a goat from a neighborhood butcher and it all went quite smoothly despite the un-easter-like weather. There were snow flurries for part of the day and temperatures in the 30s. Personally, I didn't love the taste of goat as much as the meat-loving, Australian-born James, but the event was fun and my garden remains undamaged. Isn't it amazing what you can do with cinder blocks? I think I'm disturbed by the goat roast. I know, I'm a vegetarian, so that goes without saying. But, the little goat carcass looks so sad. Where the heck did you get a goat anyway?